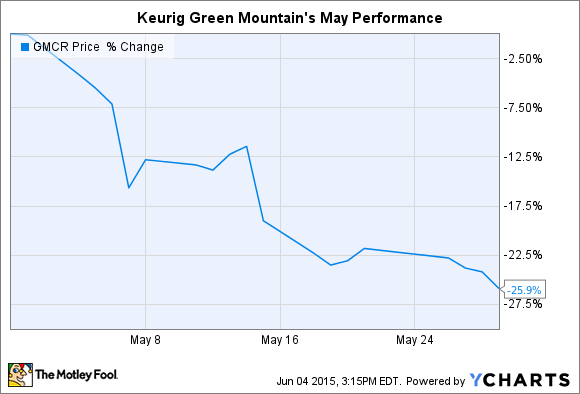 What: Keurig Green Mountain (UNKNOWN:GMCR.DL) investors saw their stock plunge by 26% in May, according to S&P Capital IQ data. The drop pushed shares to 37% below where they started the year and 48% off their all-time high of $157 in November. So what: Investors fled the stock in response to the surprisingly weak fiscal-second-quarter results the coffeemaker company posted on May 7. The company said revenue grew by just 3% in the quarter after its Keurig 2.0 brewer sold poorly at retailers. The softer-than-expected product transition led to a 23% decline in brewer sales. "Our top-line growth was below our expectations," CEO Brian Kelley said in a press release. Now what: Management lowered its full-year forecast to account for the rough reception to the new Keurig brewer. Sales are now expected to be flat in 2015, compared to the prior guidance for growth in the "mid-single to high-single digits." Meanwhile, executives are making strategic changes aimed at boosting demand for the 2.0 system while also paving the way for smoother product introductions in the future. Those strategies include lowering brewer inventories and redesigning the packaging on the 2.0 brewer to better communicate its benefits. "Combined with the upcoming launch of our Keurig KOLD system, we expect the Keurig brand to further expand and globalize while continuing to transform the premium home beverage experience for consumers," Kelley said.